Lara Khoury et Catherine Régis, «Quebec’s Contributions to Health Law and Policy Debates in Canada» dans Joanna Erdman, Vanessa Gruben et Erin Nelson (dir. ), Canadian Health Law and Policy, 5e éd., Toronto, Lexis Nexis, 2017, p. 95-132. Understand the developing and critical issues in health law and policy. Much more than the study of laws relevant to the area of medicine, Canadian Health Law and Policy draws together the legal and policy issues that are relevant to human health, and sheds new light on emerging and continuing trends. Written by Canada’s leading health law scholars, the fifth edition of this unique work provides expert commentary and analysis on a wide range of emerging health law related issues. 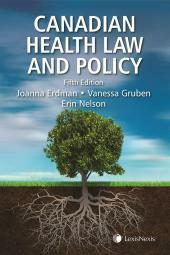 It is a vital resource for anyone seeking to understand the developing and critical issues in health law and policy. Ce contenu a été mis à jour le 16 septembre 2017 à 8 h 20 min.